It goes without saying that New England winters can be really tough on your vessel. We are thrilled to now offer winter indoor heated storage to our customers. As we all know, there are endless benefits associated with indoor storage by eliminating the brutal effects of harsh winter weather such as corrosion, mildew, fiberglass cracking, etc. And lets not forget NO shrink-wrapping ! While in storage, your vessel can be worked on and maintained by Glasstech Boat Service and Glasstech approved sub-contractors only. Let us work with you to plan ahead and alleviate hassles for spring service. 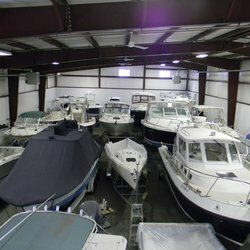 Get all repairs and maintenance done over the winter months so that you can enjoy a longer boating season!